I have seen so many pictures of homes that are gorgeous show pieces of a home, but you wonder if anyone actually lives there. The room is gorgeous, but there is nothing in the space that makes the home look lived in or personalized. I prefer my home to look like my home. I am here to tell you it is possible to get a showroom quality design all while adding some personality into your space by incorporating those people and things you are most thankful for. 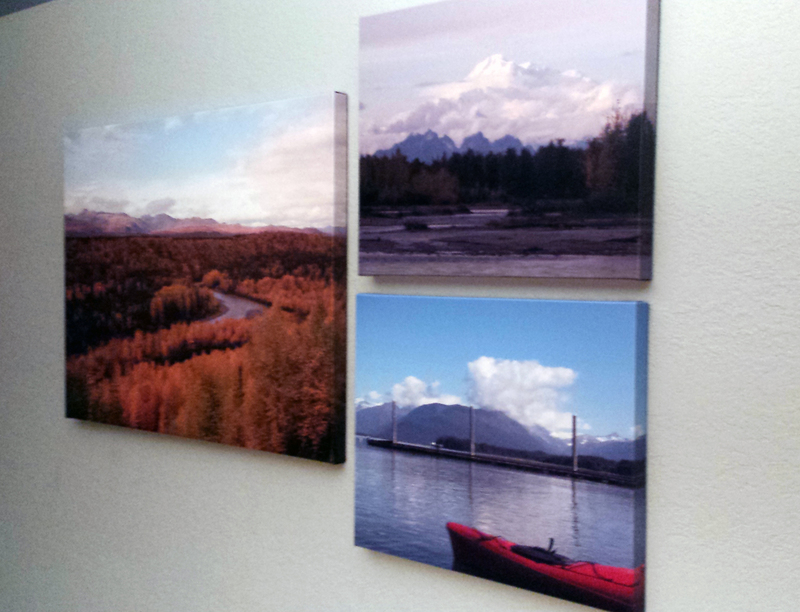 Incorporate your family photos in your home by creating a stunning gallery wall. Choose some of your favorite photos of your family having fun, traveling, or just hanging out and spending time together. 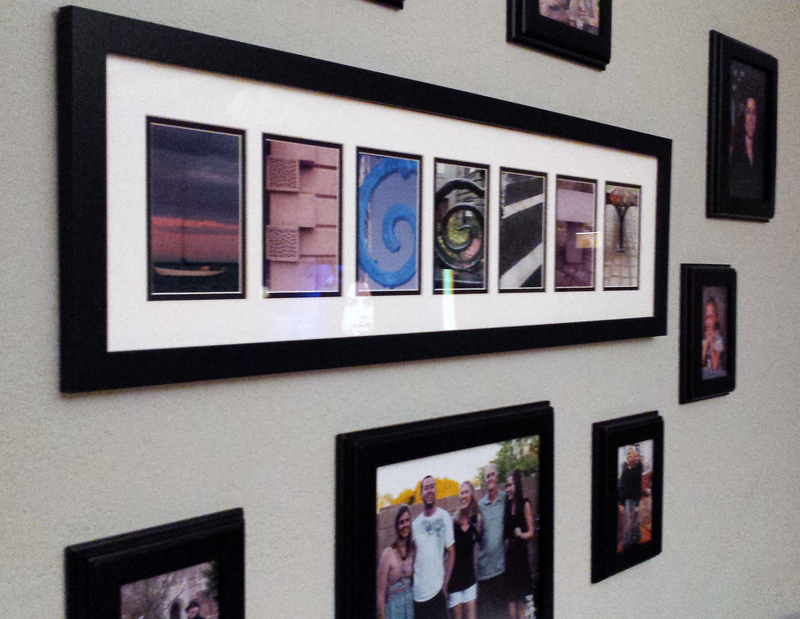 Feature your fun photos in smaller frames. Step the size up a little to commemorate big life events like college graduations or weddings. Step the size up one more time and frame your favorite family photo. Arrange all these around a family oriented work of art. The picture above shows all the family photos arranged around a piece of art that features the family’s last name. The letters of the last name are formed from photos of architectural elements. This is a great way to show off your wonderful family in a way that keeps your room stylish and beautiful. I am thankful for all the traveling I have been able to do and I love to incorporate images I take on vacation into my décor. They can be framed and displayed on shelves or you can get the images printed on canvas for some stunning artwork that is completely original to you. Besides, we all love to tell people we took that picture when we were in that place! It can be a great conversation starter when guests are over. Most of us with pets are beyond thankful for them. Do not forget they are part of the family too. Arrange photos of your pets on a shelf in different shaped, sized, and colored frames to show a little love to our 4-legged friends as well. I use a space on my bookshelf to keep pics of my 2 labs and a pic of my dog from when I was a child (we were thankful he showed up on our door step and our parents let us keep him). 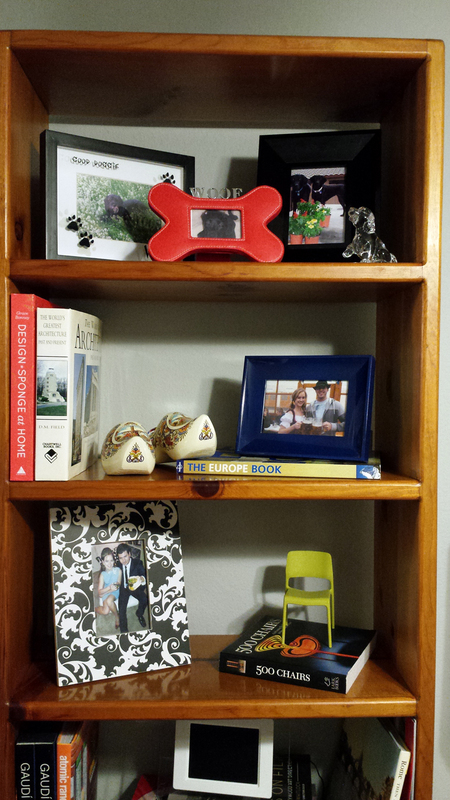 Display Images of Pets, Pictures from your travels, and some of the souvenirs you picked up along the way in a nice bookshelf display. Mix it in with some of your favorite books. Another way to incorporate your travels is to display items and souvenirs from trips. So often we buy things on vacation that sit put away in boxes never to be seen till we are cleaning out the closet. Think about things you would like to look at all the time while on vacation and buy things you can display. I have a pair of wooden shoes from Holland displayed on my bookcase (above) and a really fun Totem Pole my parents brought me from their trip to Alaska displayed on a nightstand. This is a great way to show where you have been and what you love. Most of you who are parents are thankful for your children, but what if your children are grown and have moved out? 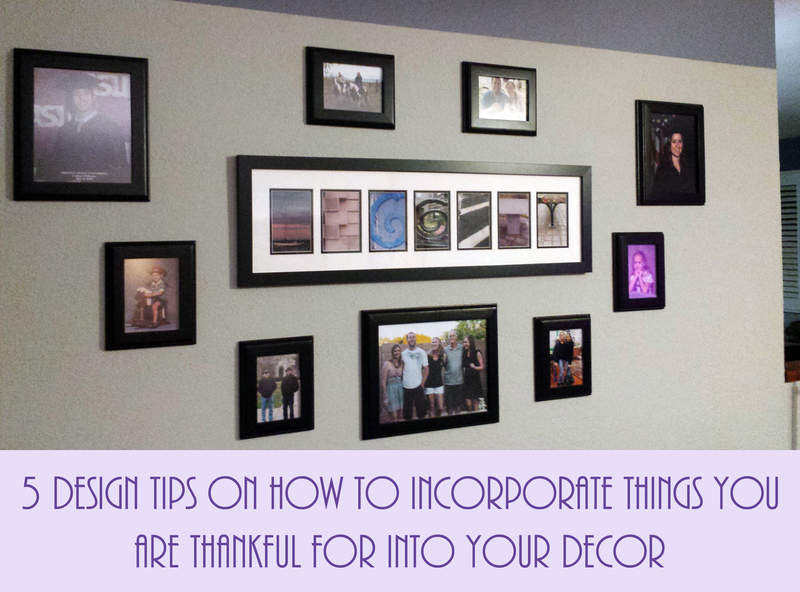 Here is a tip to add a personal touch to their old room. When we remodeled my parents’ house both mine and my brother’s rooms are now set up as guest rooms, but each one is still unique to each of us. We used the artwork in each room to still keep a little bit of us in there. My old room features artwork of Paris. 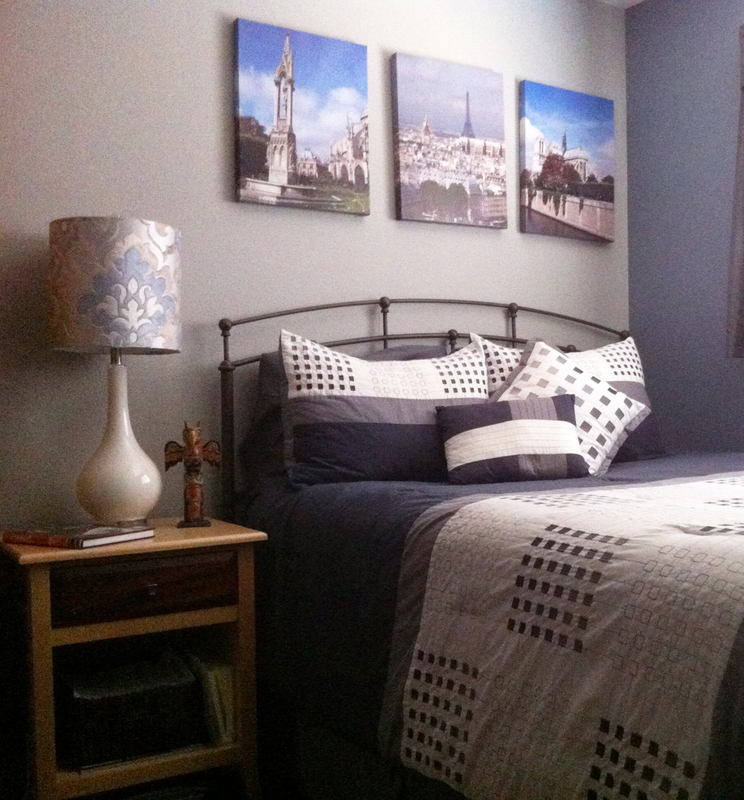 I took the pictures on my trip to Europe years ago and Paris was my absolute favorite place so we featured three great images above the bed. In my brothers old room we featured images from a trip to Boston we all took to visit him, as he now lives there. These are all simple things to do in your space to add a personal touch. The best part is you probably already have most things you need to do this. So start looking through those vacation photos from that last big trip you took, dig out the boxes of souvenirs, and start showcasing, the family, friends, pets, and travels we are all so thankful to have! Also check out our DIY Thankful For Table Runner to incorporate more of what the entire family is thankful for into your holiday décor this Thanksgiving.